In 2000, a group of NYU Law School students launched the annual Korematsu Lecture series. The lecture provides a forum to address Asian American perspectives on law and to honor Asian Americans who have added substantially to the development of the law while challenging the status quo. In 1999, Fred Korematsu received the Rainbow PUSH Coalition’s Trailblazer Award at a lunch celebrating the 58th birthday of Rainbow PUSH founder Rev. Jesse Jackson. The award honors movers and shakers who are committed to social justice. On June 30, 1998, Fred Korematsu received the Pearlstein Civil Rights Award from the Anti-Defamation League. The award is named after Jewish community leaders Carl and Virginia Pearlstein. Click here to read the story. On June 11, 1998, Mr. Korematsu received one of the first official California Senate Medals, presented to him by California Senator Bill Lockyer, Chair of the Senate Rules Committee. Other awards include four honorary doctorates from City University of New York Law School, University of the Pacific McGeorge School of Law, California State University, East Bay (formerly CSU Hayward) and the University of San Francisco. In 1988, the year President Ronald Reagan signed the Civil Liberties Act, a street in San Jose, CA was named Korematsu Court. 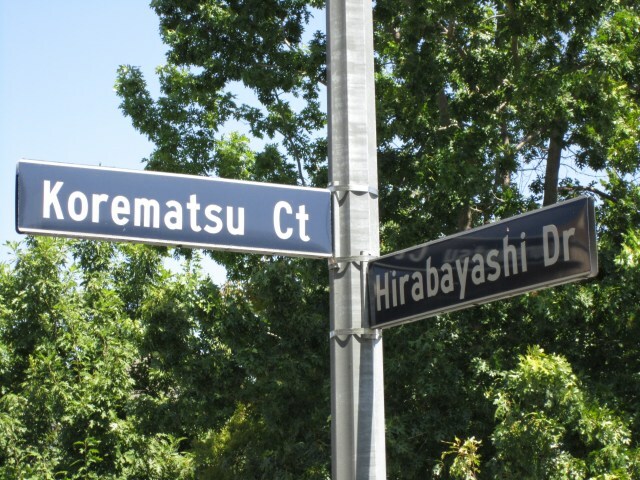 It is adjacent to Hirabayashi Drive, named after Gordon Hirabayashi, who in 1942 bravely resisted the government’s curfew order imposed on Japanese Americans.